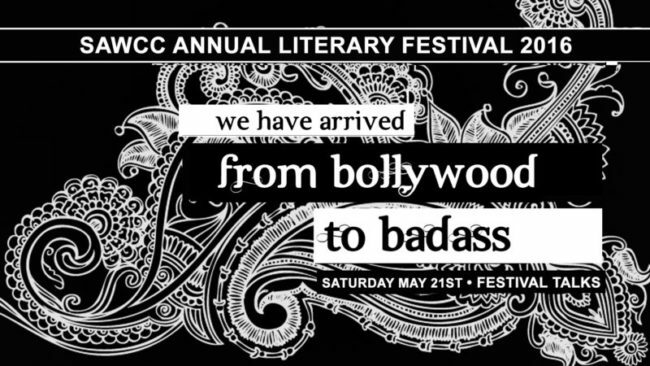 South Asian Women’s Creative Collective (SAWCC) presents its 8th annual Literary Festival We have Arrived: From Bollywood to Badass, a two-day public event in New York City. The Festival will kickoff on Friday, May 20, at 7 PM with a reading by participants of the Two Truths Writing Workshop at Sunita Bar. This will follow with panel discussions on Saturday, May 21, beginning at 12 PM and conclude with a keynote at 6:30 PM by Mira Jacob. All Saturday sessions will take place at the Asian American Writers’ Workshop, the go-to destination for Asian American literary events in New York. The festival will feature writers and changemakers who tell powerful stories, challenge stereotypes, build movements, survive trauma, find community, and heal. At a time when anti-immigrant sentiment and Islamophobia are at a peak, the 2016 Lit Fest will serve as a powerful convening where the pen is celebrated as a tool of radical activism and democracy-making. This panel will playfully weave politics and poetry with performance and audience participation. You will experience writing prompts interspersed with verses from seasoned poets as well as conversation shifting from craft to how poetry can be a tool for movement building and community storytelling. Join in for a juicy session of collaborative creativity! The personal is political and vice versa for these writers who weave issues of race, religion, caste, class, ethnicity, and more into their work. From fiction and poetry to creative nonfiction and journalism, their words have the power to illuminate how politics impacts us on an intimate level, bringing what often seems distant home. What motivates these writers to reflect politics and identity in their work? How do their audiences respond? Join us in learning how our four very different panelists merge literature with issues that matter to them. Before editing or publishing comes the difficult part of writing from a tender place and unstructured journaling. This panel will dive deep into the early phases of writing, where a writer faces the page honestly and writes from a place where it hurts. It will shift to a frank discussion that moves from vulnerability to strength. The readers will share published/public works and also share, for the first time, intimately from their journals. By “modeling” vulnerability and navigating the boundaries between personal and public, the writers will invite the audience to explore new possibilities and ways at arriving at polished work. She is the co-founder of much-loved Pete’s Reading Series in Brooklyn, where she spent 13 years bringing literary fiction, non-fiction, and poetry to the city’s sweetest stage. Her recent writing and short stories have appeared in Guernica, Vogue, the Telegraph, and Bookanista, and earlier work has appeared in various magazines (RED, Redbook, i-D,Metropolis, STEP), books (Footnotes with Kenneth Cole; Simon & Schuster; Adios Barbie, Seal Press), on television (VH-1′s Pop-Up Video), and across the web. She has appeared on national and local television and radio, and has taught writing to students of all ages in New York, New Mexico, and Barcelona. She currently teaches fiction at NYU. In September 2014, Mira was named the Emerging Novelist Honoree at Hudson Valley Writer’s Center, where she received a commendation from the U.S. Congress. Aurora Masum-Javed is a poet, performer, educator, and activist. She is currently completing her MFA in poetry at Cornell University. She has performed around the country at spaces such as the Empowering Women of Color Conference, the South Asian International Performing Arts Festival, DivaFest, Stage Werx Theatre, and APAture. She believes wholeheartedly in the revolutionary power of joy, and the necessary work of interrogation. Adeeba Afshan Rana is a poet and librarian who reads and writes in Brooklyn, NY. She often goes on adventures, works with young people, swims in oceans, and cooks meals for family and friends. Adeeba earned her MFA in poetry from Stonecoast at the University of Southern Maine and her Master’s in Library Science at Pratt Institute. She aspires to be a goddess of knowledge. Known for her sparkly eyeshadow and raucous laughter, Purvi Shah inspires change as a social justice advocate and writer. She is curious about language as dreamwork for love, transformation, and justice. She won the inaugural SONY South Asian Social Service Excellence Award for her leadership fighting violence against women. During the 10th anniversary of 9/11, she directed Together We Are New York, a community-based poetry project to highlight Asian American voices and experiences. In Terrain Tracks (New Rivers Press: 2006), she plumbs migrations and belongings. Her new chaplet, Dark Lip of the Beloved: Sound Your Fiery God-Praise (Belladonna*: 2015), explores women’s devotions, status, and being. She hosted A Woman’s World, a radio show for South Asian women to speak to community advocacy and creativity. Recently she was selected for INKTank, a 12-week residency for playwrights hosted by the Rising Circle Theater Collective. You can discover her work @PurviPoets or http://purvipoets.net. Anisa Rahim is a writer and a public interest lawyer. She has a B.A. from the University of Chicago and a law degree from Temple Law School. Her various avatars have included legal aid advocate, human rights lawyer, and professor at an Indian law school. She is currently working on a book weaving together memoir, fiction and poetry to tell her family history. She is thrilled to have graduated in May from the MFA program in creative writing at Rutgers-Newark and currently lives in Jersey City. Deepa Iyer is a South Asian American activist, writer, and lawyer. Deepa is currently the Senior Fellow at the Center for Social Inclusion where she provides analysis, commentary and scholarship on equity and solidarity in America’s changing racial landscape. In November 2015, The New Press published Deepa’s first book, We Too Sing America: South Asian, Arab, Muslim and Sikh Immigrants Shape Our Multiracial Future. Deepa’s book has been selected by the American Librarians Association’s Booklist magazine to be one of the top 10 multicultural non-fiction books of the year. Deepa served as the Executive Director of South Asian Americans Leading Together (SAALT) for a decade, and has worked at the Civil Rights Division of the Department of Justice and with Asian American communities at local and national levels. Deepa blogs at www.deepaiyer.com and tweets @dviyer. Chaitali Sen is the author of the debut novel The Pathless Sky, published by Europa Editions in 2015. Her short fiction, reviews, and essays have appeared in New England Review, New Ohio Review, Colorado Review, Los Angeles Review of Books, The Aerogram, and other journals. She holds an MFA from Hunter College and served on the executive board of SAWCC in its early days. She currently lives in Austin, Texas, where she is working on a new novel and a book of lyric essays. Marina Budhos is an author of award-winning fiction and nonfiction. Her newest novel, Watched (Wendy Lamb Books/Random House, September 2016), takes on surveillance in our post 9/11 world. Watched is a companion book to Ask Me No Questions, which received numerous honors, including ALA Best Books and Notable, the first James Cook Teen Book Award, and is taught in school districts throughout the country. In 2017, Budhos will also publish The Eyes of the World: Robert Capa, Gerda Taro & The Invention of Modern Photojournalism, co-authored with her husband Marc Aronson. Their previous book, Sugar Changed the World: A Story of Magic, Spice, Slavery, Freedom & Science, was a 2010 Los Angeles Times Book Award Finalist. Budhos’s other books include Tell Us We’re Home, The Professor of Light, House of Waiting, and a nonfiction book, Remix: Conversations with Immigrant Teenagers. She is currently a professor of English at William Paterson University. Yashica Dutt is a New York-based writer covering caste, gender identity, and culture. She is a graduate of Columbia Journalism School and was previously a principal correspondent with the Hindustan Times in New Delhi, where she worked a journalist for almost a decade. She recently ‘came out’ as Dalit – a member of one of lower castes in India, publicly identifying with a status that is among the most oppressed in India and started dalitdiscrimination.tumblr.com to document instances of caste-based discrimination against Dalits. Her work has been featured in VICE and Huffington Post, among other publications, and she’s also appeared as a guest on NDTV’s Left Right & Center. She is currently working on a book on the caste system in India and her experience of coming out as Dalit, which will be published by Alpeh India early next year. Swati Khurana has been published inThe New York Times, Guernica, The Weeklings, Narrative.ly, Mr. Beller’s Neighborhood, The Rumpus, and Asian American Literary Review. She has exhibited at the DUMBO Arts Festival, Queens Museum of Art, the Smithsonian Institution, and received awards from Jerome Foundation, Bronx Council of the Arts, Cooper Union, Center for Book Arts. She completed her MFA in Fiction from Hunter College, where she was awarded the Mary M. Fay Award in Poetry and a Hertog Fellowship. A Kundiman fellow, she is writing a novel titled The No.1 Printshop of Lahore. She is a founding member of SAWCC. Ashwak Fardoush is a writer, a writing coach and an educator. She is also the founder of Roots & Wings: A Writing Circle. She leads coaching sessions and facilitates workshops to help writers tell stories that are dancing inside of them. Writing commands her to look at herself and the world courageously and compassionately. She believes that she is not simply writing her stories, but that her stories are writing her too. She is currently working on a collection of short stories titled At the Edge of Laughter. Her writing appeared in The Margins. Mira Jacob is the author of the critically acclaimed novel, The Sleepwalker’s Guide to Dancing, which was shortlisted for India’s Tata First Literature Award, honored by the APALA, and named one of the best books of 2014 by Kirkus Reviews, the Boston Globe, Goodreads, Bustle, and The Millions. She is the co-founder of much-loved Pete’s Reading Series in Brooklyn, where she spent 13 years bringing literary fiction, non-fiction, and poetry to the city’s sweetest stage. Her recent writing and short stories have appeared in Guernica, Vogue, the Telegraph, and Bookanista, and earlier work has appeared in various magazines (RED, Redbook, i-D,Metropolis, STEP), books (Footnotes with Kenneth Cole; Simon & Schuster; Adios Barbie, Seal Press), on television (VH-1′s Pop-Up Video), and across the web. She has appeared on national and local television and radio, and has taught writing to students of all ages in New York, New Mexico, and Barcelona. She currently teaches fiction at NYU. In September 2014, Mira was named the Emerging Novelist Honoree at Hudson Valley Writer’s Center, where she received a commendation from the U.S. Congress. She lives in Brooklyn with her husband, documentary filmmaker Jed Rothstein, and their son. All events are open to the public. No one will be turned away for lack of funds. For questions, please email litfest@sawcc.org. This program is supported, in part, by public funds from the New York City Department of Cultural Affairs, in partnership with the City Council. This entry was posted in Events, Literature, Performance, Talks, Uncategorized. Bookmark the permalink.